Call me De gratis artist. Every community has to have a village idiot and a token artist. That's me (the token artist - wise guy) and since my daughter stars in the high school play....guess who does all the backdrops? I enlisted a friend, and together we banged out three 14'x42' backdrops in little over a week - working the graveyard shift to get it done in time. I do manage to have some fun though. This pic is of the show curtain I decided to give a carny theme to, which actually has very little to do with the wholesome, hoaky world of the Iowa state fair. 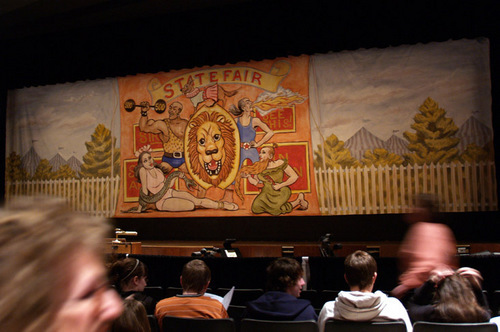 Also managed to borrow a circa 1900 Coney Island carousel lion for the play. Had restored it some 6 or 7 years ago after it's discovery in a storage shed. Some knucklehead with a goldfinger fixation had sprayed it with gold paint and (probably) having realized the crime he'd comitted, abandoned it to decay. I'll post a pic of the lion in it's current glory.